Travelling is so luxurious. Breathtaking scenery, mouthwatering food and some much-needed relaxation, with not a care in the world except deciding what to experience next. That is how you want it to go at least, except within minutes of hopping on the plane your skin is feeling tight and irritable and before you know it there is a very large pimple protruding from your chin. Hand-luggage and international airline travel restrictions make taking your full DMK skin care arsenal with you a challenge. Now you can travel light and still have the best of DMK at your disposal with DMK’s Limited™ Travel Collection! Your skin will feel as luxurious as your holiday. Tight, dry and breaking out, your skin never feels great 38,000 feet up in the air. There’s a combination of factors that can be contributing to your less than stella skin. Like being at the top of Everest, without the threat of hyperthermia of course, humidity and oxygen levels are lower. On average a person’s body will lose 1.5 litres of water for every three hours they are in the air. Unless you are drinking well over the normal recommend eight cups of water, your body will become dehydrated very quickly. At the same time, less oxygen is being absorbed into your blood stream resulting in headaches, sleepiness and skin as dry and irritable as the Sahara Desert. Add on top of this mental strain of packing, negotiating everything transport related; taxis, tickets, terminals, made even more strenuous if you don’t like flying. Your poor skin is at a severe disadvantage. Brave the prospect of using aeroplane toilets and take an empty water bottle to be filled on the plane to stay hydrated. An even less appealing tip but just as effective, try and stay away from alcohol and coffee as they will only dehydrate your body even more. You’ll have plenty of time during your holiday to sip delicious café and vino. Pack your DMK’s Limited™ Travel Collection in your carry-on luggage and use Wetter Than Water™ for a rejuvenating spray that is more powerful than the natural hydrating and nourishing benefits of water. You can spray it over other products and makeup to increase and retain the moisture in your skin counteracting dehydration and supporting the internal functions. It’s deep penetrating ingredients have volumising, anti-inflammatory, anti-oxidant, free radical scavenging and immune boosting properties. You will walk off that plane looking better than when you boarded. During your travels you are more than likely going to experience everything the seasons have to offer. Laid back island summers are idyllic but sandy, salty, and sweaty and can trigger breakouts particularly for people with already oily skin. Similarly, for city loving jetsetters exploring the high life of New York or Dubai the last thing you want is clogged pores and flaking skin caused by the city smog. In these environments cleansing is your number one skin priority and Mediterranean PearlsTM is the perfect buffing cleanser for lifting away dead cell material, dirt and makeup. Simultaneously the Vitamin B rich formulation works to repair the skin so you are refreshed and ready for whatever the day might bring. On the opposite side of the world dry, irritated skin can interrupt the winter fun of snuggling and skiing the powdery slops of Japan or Switzerland. Keep your skin protected and covered particularly when there are strong chilling winds while also making sure not to sit to close to heating devices. Moving between the bitter cold of outside to the luscious warm interiors can be too extreme for the skin causing it to become red, tight, rough, cracked and irritated. Use TransGensis™ alongside Wetter Than Water™ to keep the skin moisturised and functioning optimally. Both these products also have free radical scavenging properties, which is fantastic for protecting your skin while you travel. No matter the climate while you explore your getaway location you are exposed to UV radiation even when you cannot see the sun. TransGensis™ and Wetter Than Water™ will help to fight the ageing and weathering effects of free radicals that collect on the skin from UV radiation, helping you to avoid returning home looking well-travelled and haggered. DMK Limited™ Travel Collection is not just going to protect and maintain your skin while you are travelling. It is going to treat your skin to its own luxurious holiday and have you looking amazing in every photo. For those special nights out, key photo moments and just for the general desire to look and feel amazing FirMatrix™, Eye Web™ and Elevate™ will do more than any face of makeup can and in a shorter amount of time! An instant face, eye and neck lift, this powerful trio will have all your friends booking their next trip after seeing your photos because clearly travel does wonders for the skin! 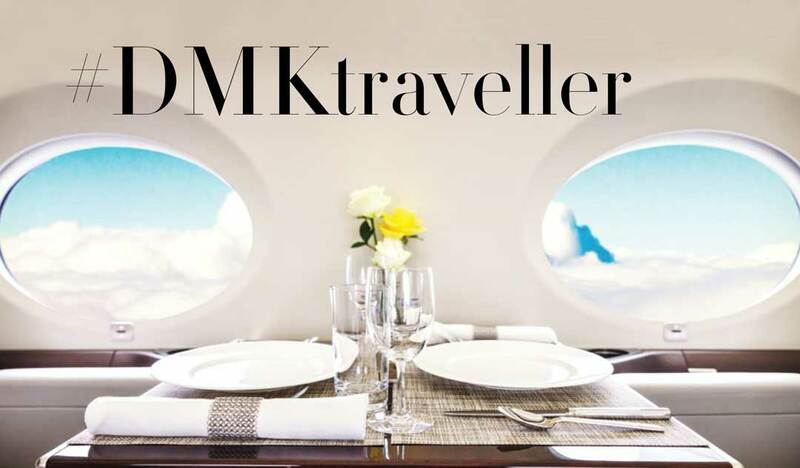 Ready for every place and time DMK’s Limited™ Travel Collection is the ultimate luxury holiday companion. Visit Integrity Skin Clinic before your next trip for this collection and ask them how you can best prepare your skin for travel.